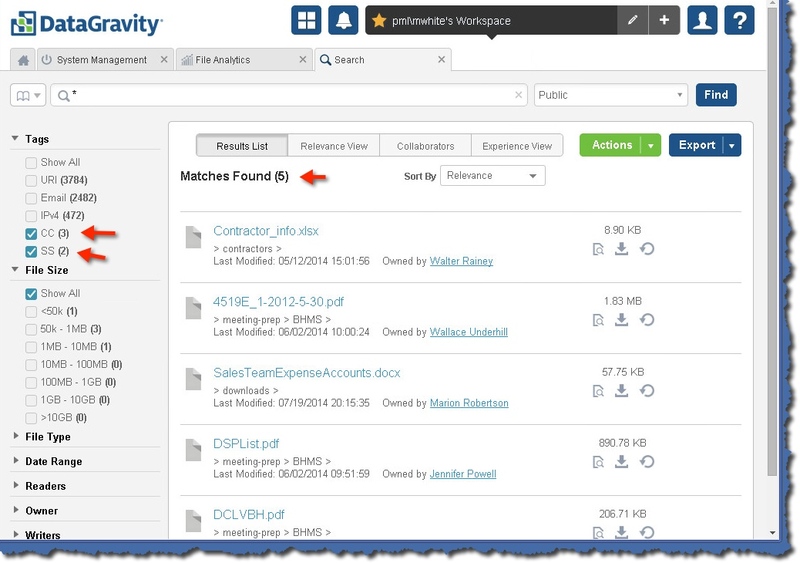 UPDATE – this will only apply to DataGravity customers who have storage arrays. Customers that have only the software will find that this search info doesn’t work. I couldn’t resist. Hunting for treasure sounds pretty cool and don’t we all like to do that? Really I could have called this hunting for PII but that doesn’t have the same ring to it. But lets get started. 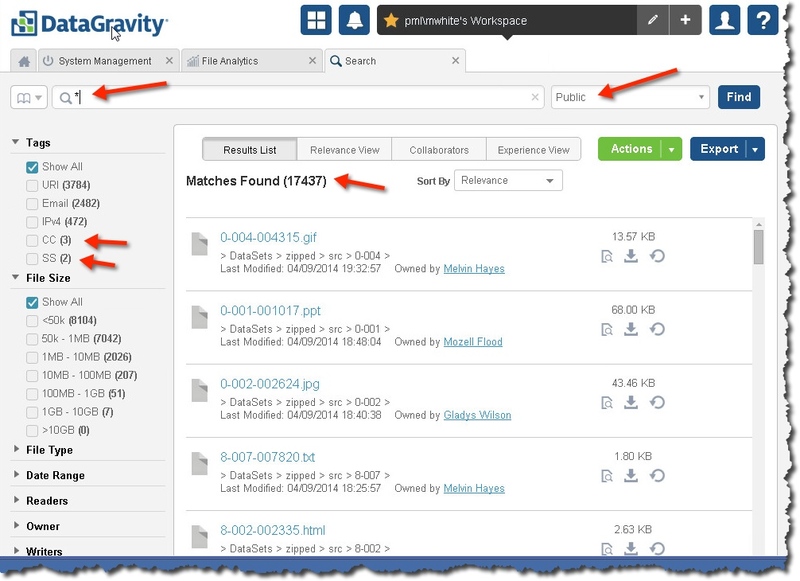 We are following up on the previous blog I did about what DataGravity sells. I wanted to talk today about something I think is pretty neat. It is part of what we think makes our storage Data-Aware storage. The idea that everything on our storage is cracked – where possible – and indexed. This makes for some interesting searches. We should talk about what PII is – I am not sure if everyone does know what it is – but it stands for personally identifiable information (PII) and an example would be a credit card or Social Security number. Information that connects to you. Now lets see if my storage has any PII on it. I pick the share I am interested in and I use the * to search for all files. As always you can click on the image below to see something bigger. We are particularly interested in the tags that signify credit cards (CC) and Social Security (SS) numbers. The arrows in the image above point out the various steps we went through. Lets select the two tags – CC and SS – that will narrow down our results for us. We went from thousands of results to 5. A little easier to work with. Lets use the Preview button for the first document and make sure we have a real Social Security number. That is the first button on the far left. You will see something like the following. We can see that there is a column that is Social and it does look like there is Social Security numbers present. So now we need to know more – like who did this and who saw this? To investigate more, we should double-click on the file. We will see something like below. This is an information rich screen! We can see a lot of things. 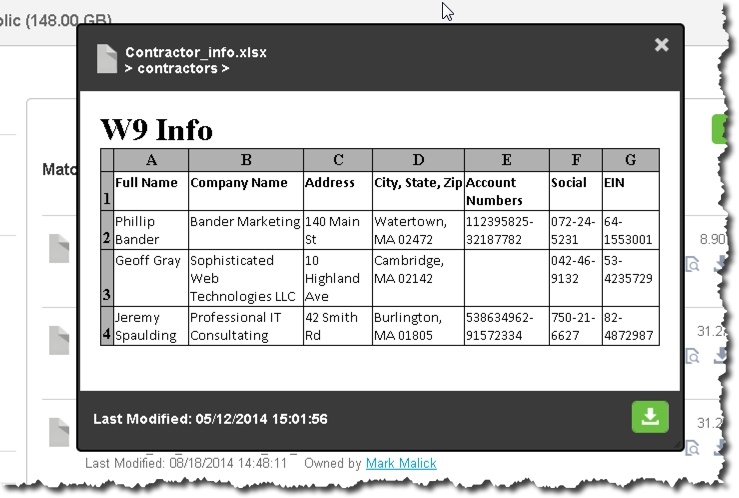 Note in the top right corner – File Details we can see SS Number in the Identified field. In the middle of the screen we see Top Users by Activity. This allows us to see who has read or written to the file that contains the Social Security number. Recent Tasks and File Activities are quite useful when you are looking to understand the life of the file. Another way to look at this page is to think about the impact of the Social Security number – who has seen it – what is the damage? We can see on the left in the File Versions area that every version of the file is owned by the same guy. So a good person to talk to about this file. But in the middle of the screen we can also see others who have read and written to the file so a good bunch of people to talk to and remind about Company Confidential. 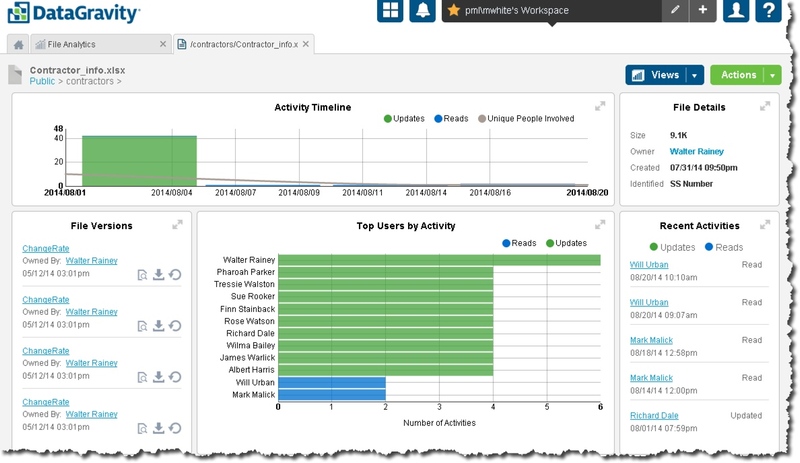 You can find supporting material if necessary, for example you can expand the Recent Activities window – see the arrows in the top right of that widget? If you select it you will see the following image. See the level of detail here? Being able to track operations on the file by whom and when. Very powerful and detailed. As of v2 of our software you can define your own custom tags. Meaning that you can define your own PII, and catch it just like you can credit cards. As well, we added in some sample custom tags. See this for more info on version 2. In a very short period of time we have determined that we do in fact have Social Security numbers on our array, who created the file and who looked at it. Very quick, and very easy. You can make sure that your storage does not have information on it that it should not – such as credit cards and Social Security numbers in the clear. BTW, we will be at VMworld, and we hope we can show this great technology to you, so please come by booth 1647. We will have SE’s and technical marketing to demo things for you. I will also be there much of the time at the whiteboard and willing to spend more time with people that want to chat about this. Just ask for the whiteboard! 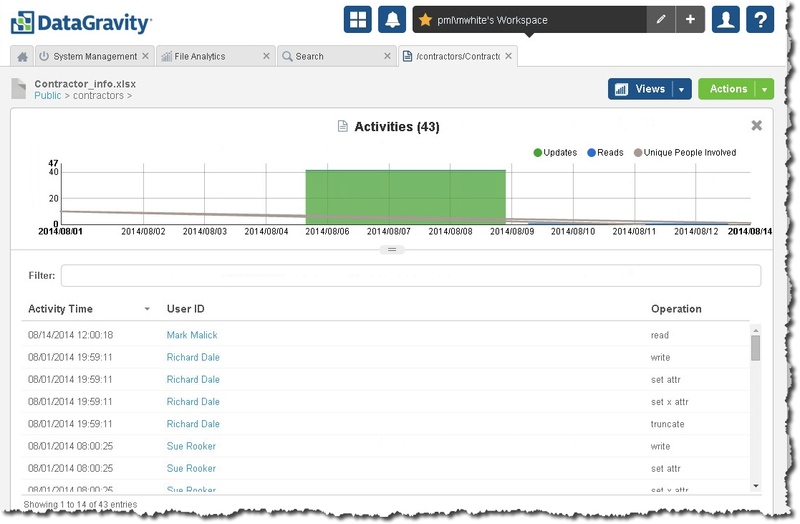 11/21/15 – updated for version 2 of DataGravity software and made the screenshots bigger. 11/21/15 – added the DGTech tag so that means you can easily find all of the technical DataGravity articles. Previous Post We are Data-Aware Storage!